Hob is a relative newcomer to the i and a very welcome addition to the cast, having provided a handful of puzzles all of which have been conspicuously witty and inventive. More of the same today, and I for one enjoyed myself immensely despite the theme being based on one of my worst blind spots. The consensus over at Fifteensquared back in June 2013 was that it’s a pretty difficult crossword, and it probably is a touch trickier than the Tuesday average. All fair and above board however, with the exception of 24ac which caused a near riot amongst the Francophone contingent on the other side. I’m glad Eimi saw fit to leave it in: it’s not as if there’s any ambiguity in the clue vis-à-vis the required answer after all, even though it would doubtless provoke a derisive sneer from across La Manche. I found this a little trickier in places than par for Quixote, mostly because I made heavy work of my last few in – 4d, 8ac, 9d and 18ac at the very close. I ambled over those last few, coming back to the puzzle when I had time, and still finished in a time under par for the i, so this was still a relatively gentle introduction to the working week. COD? Lots to enjoy as always, my favourite today being 5d – “Bishop wants someone obsequious, the sort that family might shun (5,5)”. Just 24 clues for a change and the four longer entries near the periphery formed a sort of cultural tour, Phi informs us in the 2013 blog here. As a side note, I completely fail to understand why so many on the other side seemed to think Phi had deliberately led people up the garden path into thinking 11a might be Rhetoric – when the anagram fodder wasn’t there – perplexing! Our second IoS reprint of the week comes courtesy of Hypnos. Perhaps not as straightforward as Monday’s offering, this was still on the easy side for the i, with no major hold-ups along the way. I didn’t know the dog referenced in 1d, but the club could be little else. Also had to think a bit about what 20ac might be – funnily enough, the first letter was one I hadn’t scribbled down beside the H in an attempt to jog my memory. Last in 21d which sort of works, I suppose. COD? Ok, it’s an old one, but 25d is still quite elegantly succinct – “Deep sea fish (4)”. A little on the tricky side today I thought, especially in the NW corner. Dac’s clues are always so elegant, and the surface readings so deceiving, that spotting the wordplay isn’t necessarily straightforward, especially when you’re staring at a one-quarter empty grid. In retrospect all is fair, above board, and obvious, though it wasn’t always so while solving. Finish time a little over par for the i, and quite a bit longer than is usual for Dac. As good as ever on a Wednesday, I’ve got ticks beside 1ac, 11ac, 24ac just for starters. COD though goes to my last one in, 13ac – “End of trimester? (8)”. Now that’s what I call a preamble. Letters to be lifted, words to be moved, unclued entries. Eek. The grid’s a more sensible size this week, though, which is something positive at least. Onward. And look, I’ve spotted a letter to be moved to the clue above almost straight off. Huzzah. And a word that needs to be moved to the right in one of the downs. Double huzzah. But why do some of the down clues have answer lengths that are shorter than the space in the grid? I thought I knew what I was doing there for a bit. Concentration levels aren’t helped by Saturday afternoon spent in the seventh circle of hell, in other words the children’s section of Clarks Shoes. And Sunday afternoon finally getting a bit of weather dry enough to finish sorting the garden for Autumn. Rock n roll. There, all done, and hope there isn’t something obvious I’ve missed in a slightly bitty, we-need-to-cram-this-into-whatever-time’s-available-because-I’m-busy sort of solve. The three words we were supposed to garner from the letters / words moved? I sort of worked those out in retrospect given what I had and the unclued down, just in case they were meant to be some sort of instruction. They weren’t, were they? 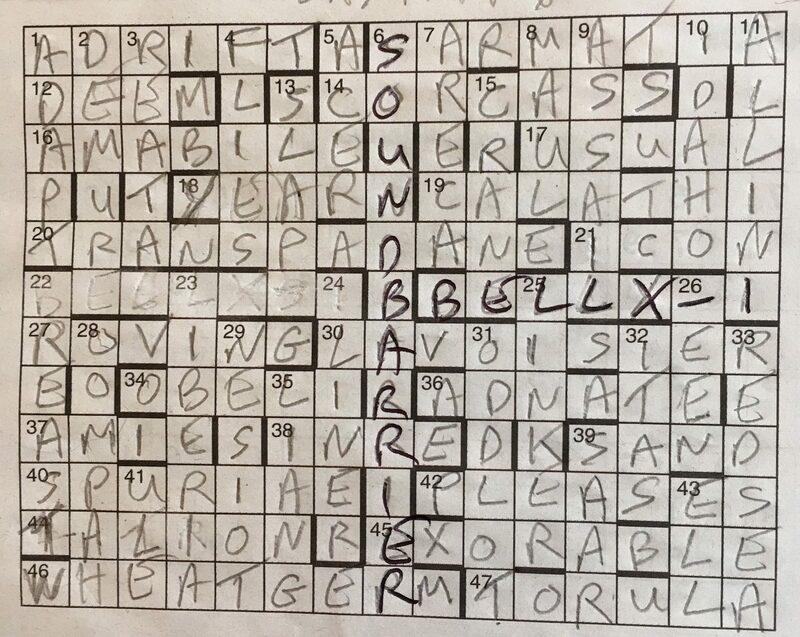 Another interesting crossword from Jambazi, rather tougher than the Tuesday average in my estimation. As before there’s plenty of variety on offer and some clever clue constructions which took a bit of unpicking. There is a mini-theme which means nothing to me, so I’ll simply refer the curious to comment no.5 on the June 2013 Fifteensquared blog entry in which Jambazi explains what’s going on. I did wonder if there was something concerning Harry 22d tucked away in there, what with 5ac and the curious fact that 17ac is his headmaster’s middle name – but apparently not. An IoS reprint to start the week, and it couldn’t have been much easier. Well, I found the NE corner to be a little chewier than the rest, but only relative to an extremely straightforward puzzle. I was unsure about the synonym for result in 6d, but the more I think about it the more sense it makes. Otherwise nothing really to question. Another good one for beginners, and for older hands who’re grateful for a relatively gentle start to the week. No, I haven’t woken up yet. COD? With lots to appreciate, 10ac – “One serving of cake at present (9)”. In which, yet again, Phi proved himself the master of the ingenious grid fill. There were four long 15 letter lights, and then tucked into the corners was the 12 letter word SOP-HIS-TIC-ATE split into those four short words – very nice. Otherwise all pretty 4d (Straightforward) and solidly the Phi we’ve come to expect. Fifteensquared blog from 2013 here with talk about what is or maybe isn’t an &Lit clue, in case you wondered.